The old FBT company car rules resulted in some quite ridiculous outcomes. In fact they still do, because apparently they still apply for existing leases. Basically the rules meant that the further you drive, the less tax you pay. Which means people were strongly encouraged to drive long distances to save money — often driving for no real reason other than to make it into the next distance bracket and get a lower rate. Over 40,000km travelled in a year – 7% FBT liability = 0.07 statutory fraction. I don’t know what genius came up with the way the tax laws worked, but really, what an utterly stupid system. The other day I heard of a friend of a friend who has got her car doing the ultimate: I forget the precise numbers involved, but basically in order to avoid a big tax bill she needs to put thousands of kilometres on the clock by the end of the year. Rather than spend the week going on a pointless long drive, her mechanic has devised a scheme whereby the car is up on blocks, and is set up so it can drive while stationary. Presumably they’ve put a brick on the accelerator and/or put it into cruise control, and the car is clocking up all those kilometres while not having to have a driver in it. Quite amusing in a way, but this is the result when there are stupid laws. Thankfully the tax system has changed, and for new leases signed since May, a more sensible flat rate system applies. 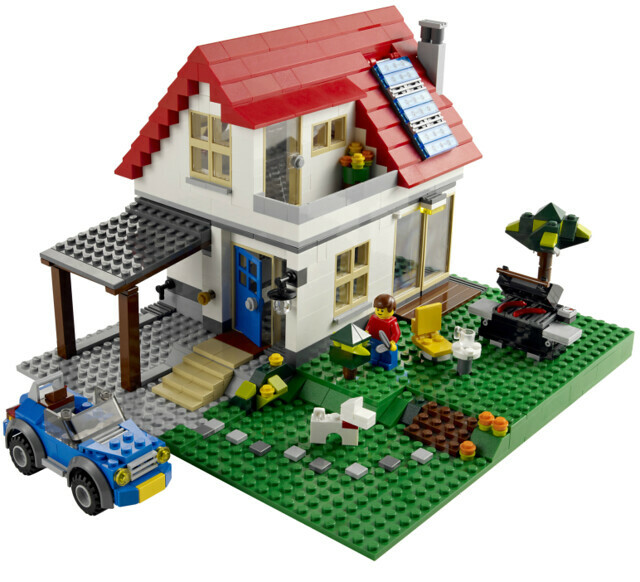 New for June… a Lego house with solar panels on the roof. 1. I simply don’t understand how the deniers can continue to be taken seriously by anybody when the vast majority of climate scientists agree there’s a problem that needs to be fixed. It also seems a peculiar view that the world’s population can continue to burn fossil fuels in huge amounts with no consequences. 2. It’s true that Australia represents only a small fraction of overall global emissions. But people are are watching, and influence is important. On any issue, people look to those who are leading the world. Here’s a small example: while I’m not even sure I agree with it, it turns out that inner-city Melbourne has been hailed as a world leader in pedestrian-friendly streets. If we have any hope at all of convincing others to do something about reducing emissions, we have to get our house in order. 3. The scheme sounds like a pretty good start. If the modelling is right, it’ll have a minimal effect on the overall economy (0.1% of GDP) while providing a good price signal that big companies in particular need to find better ways of doing things. 5. There’s some niggles. The Australian Railway Association notes that with petrol exempt and heavy (road) vehicles exempt for some time, railways, which should provide a less carbon-intensive way of moving people and freight, will be disadvantaged by not being exempt. One estimate is that it may push up public transport fares by about 2%. 6. The second niggle (but a political reality) is that the scheme is aimed squarely at the big emitters, and with lots of compensation to individuals, there’s little or no incentive to change personal behaviour. Hence, petrol is exempt (but as Phil Hart from ASPO said at a recent PTUA member meeting, including it wouldn’t have made much of a price difference compared to what will happen when peak oil really kicks in). 7. Personally I’m not sure if I’ll end up ahead or behind in economic terms. The Estimator tool on the government web site told me “The household situation described by the information you have entered is not covered by the scenarios used by this Estimator.” Oh well. From the looks of it, wealthier people can’t count on the tax changes to get all their costs refunded. But then, they are precisely the people who can afford to cover their roofs in solar panels themselves to cut their electricity and gas costs, and cut their direct emissions and costs that way. 8. Niggles aside, I do think it is important to get the ball rolling on reducing emissions, and it does seem to me that putting a price on pollution sends an important market signal that will get that process underway. We know some people have experienced delays and frustration caused by our essential systems upgrade. Unfortunately, the size of the systems we deal with means they are incredibly complex. Also, given the importance of the tax and superannuation systems to Australia, we need to ensure the reliability of our processes. Apparently an investigation has been started, though on the bright side, other than wondering why it was taking so long, it didn’t cause me any heartache. The Henry Review and the government response were released on Sunday. I had hopes there’d be some genuine, wide reform. Certainly Henry noted a lot of different options, some 138 recommendations in all. With my PT hat on, the one I was watching most closely for was a rollback of the ridiculous fringe benefits tax on cars, which has a sliding scale which encourages people to drive further — and is costing taxpayers more than $2 billion per year. Henry recommended making it a flat 20% (compared to the current 7% to 26%). The government has been silent on this one though. How about the idea of the optional tax return? Tax returns would be made simple and effectively optional by giving everyone a automatic standard deduction for work expenses, freeing most employees from the need to prepare a return, ”instead allowing them to lodge a default return prepared by the tax office”. Taxpayers who wanted to claim more ”would still have the option” of submitting receipts. Mr Swan said yesterday he was ”attracted to the idea” of making tax returns simpler and hinted he would announce changes soon. But overall, the government’s response seemed like a fizzer. Only about 10 of the 138 recommendations will be implemented — and they’ve specifically ruled out 18. But in terms of really making a difference, really simplifying the tax system, it’s ardly the kind of revolutionary reform we might have expected. Well at least, not yet. We’ll see what happens after the election. You can tell how much spin is going on from the number of times the tired old cliche of “working families” gets mentioned. The count from Rudd’s interview on AM on Monday morning: 5 in an 8 minute interview. Marita’s gone off overseas with Justine to explore San Francisco and surrounds. Management of time is often an issue for me, and I in no way want to say that her presence is a cause of me not getting things done. Reality is though, I’ve found myself busier than ever. For example, tonight there’s a dinner, tomorrow I’m going to a protest and then Trish’s wedding!